Prof. Kahng received the Ho-Am Prize in Engineering (2019) in recognition for the ennoblement of the human spirit in academics, the arts, and human welfare (link) [cached]. Prof. Kahng gave the TAU-2019 keynote talk, "From Recovering Time to Timing Recovery: Some Challenges for the TAU Community", today in Monterey. The slides are available _here_. Prof. Kahng presented _these slides_ on the subject of the OpenROAD project and EDA open source, at the Emerging Technologies for EDA workshop in Hsinchu. Prof. Kahng presented _these slides_ in the "AI Computing for Smart Life: What, Why, Who, and Where" panel at AICAS-2019 in Hsinchu. Congratulations to Minsoo Kim on passing his ECE Prelim Exam today!!! Congratulations to Kwangsoo Han on filing his Ph.D. thesis!!! Congratulations to Hyein Lee on filing her Ph.D. thesis!!! We are happy to announce that the TritonCTS repository on github is now public as part of the DARPA OpenROAD project. Kudos to Kwangsoo Han, Dr. Jiajia Li and Mateus Fogaça for all their hard work on this! We are happy to announce that the RePlAce global placement tool repository on GitHub is now updated with the first timing-driven version (v1.1) of RePlAce. Kudos to Mingyu Woo for all his hard work on this. Congratulations to Lutong Wang on passing his University Qualifying Examination!!! Congratulations to Kwangsoo Han on passing his Ph.D defense!!! Congratulations to Hyein Lee on passing her Ph.D defense!!! All members of the VLSI CAD Laboratory attended the first Workshop on Open-Source EDA Technology at ICCAD-2018. We presented this talk on digital open-source EDA status and this poster on open-source RTL-to-GDSII tool status. Group members also helped put together this extended abstract on "METRICS 2.0" in the workshop notes. We are happy to announce that the TritonSizer repository on github is now public as part of the DARPA OpenROAD project. Kudos to Hyein Lee, Dr. Jiajia Li and Minsoo Kim for all their hard work on this! We are happy to announce that the OpenSTA repository on github is now public as part of the DARPA OpenROAD project. The software is open source, licensed under GPLv3. Kudos to James Cherry for all his effort to make this happen, and for his willingness to provide this timer to the world! Prof. Kahng presented [this slide deck], "Driving, Driven, Along for the Ride: Evolutions of EDA, Manufacturing and Design", in his keynote at the EDPS-2018 Workshop in Milpitas, CA. The OpenROAD project website is now available ! Please visit https://theopenroadproject.org. We are happy to announce that the RePlAce global placement tool repository on github is now public. Kudos to Lutong Wang, Dr. Ilgweon Kang and Mingyu Woo for all their hard work on this. Prof. Kahng presented [this slide deck], "Opportunities for Machine Learning in IC Physical Design", at the 2nd IEEE/ACM International Seasonal School on Physical Design. UCSD was mentioned in the DAC-2018 SKY talk "DARPA is building a silicon compiler", by Andreas Olofsson, program manager at DARPA. Andreas's presentation slides are [here]. An EE Times article about the SKY talk is [here] [local cached copy]. Prof. Kahng helped present Tutorial #4, "Designing in Advanced Technologies: A Quick Review of Approaches", at DAC-2018. The slides are [here]. The [DAC Workshop on Machine Learning in Design Automation (MALENDA)] [cached local copy] will take place from 8:45am to 4:45pm this Sunday, June 24. Prof. Kahng and Dr. Rasit Topaloglu of IBM co-organized the workshop. Prof. Kahng's talk slides and any panel slides will hopefully be posted [here] and [here]. Prof. Kahng organized a DAC-2018 Birds-of-a-Feather meeting on "Open-Source Academic EDA Software" this coming Wednesday, June 27, from 7:00pm - 8:30pm Pacific Time in Room 3005. This meeting is for anyone interested in a robust ecosystem of free, open-source academic EDA tools. Topics for discussion include the goals for such an ecosystem, along with current landscape, key gaps, pending contributions, and potential strategy/roadmap for the worldwide academic/CAD community. Potential contributors, developers, advisors, users... Everyone is WELCOME ! Please fill out the Google Form at [LINK1] , especially if you'd like to present something to attendees! Outcomes of this meeting will be visible at [LINK2] afterward. Congratulations to Tushar Shah (M.S. ECE (Computer Engineering)) and Sriram Venkatesh (M.S. CSE (Computer Engineering)) on graduating at today's commencement ! Congratulations to Sriram Venkatesh for receiving the Honorable Mention in the Masters award for Research category, at the annual CSE end of the year celebration!!! 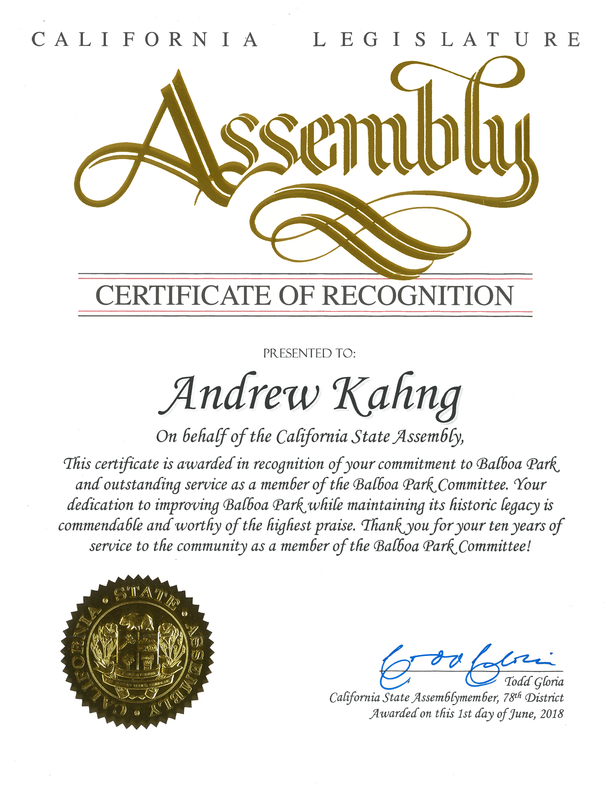 Prof. Kahng [finished] his 10+ years of service on San Diego's Balboa Park Committee and the Balboa Park / Morley Field Recreation Council. More time for school! Our 10 year-old link to RentCon Rent parameter calculation scripts are now open to all. Please find documentation and source code at link. The code is updated to be compatible with gcc 5.4.0 or higher! Congratulations to Sriram Venkatesh on filing his M.S. thesis!!! A tool that employs Multi-Armed Bandit Sampling strategies for optimal EDA tool allocation in a resource-constrained environment has been developed by the students in ABKGroup. A link to the code, as well as complete documentation on how to use it, can be found at link. Congratulations to Jonas Chan on filing his Ph.D. thesis!!! Prof. Kahng's ASP-DAC 2018 keynote, "Quality, Schedule, and Cost: Design Technology and the Last Semiconductor Scaling Levers" (Powerpoint source with speaker notes included). Semiconductor Industry: An Interview with Prof. Andrew Kahng, by Chosun Media Group (link). Congratulations to Bangqi Xu on passing his ECE Prelim Exam today!!! Congratulations to Jonas Chan on passing his Ph.D defense!!! DAC-2017 panel on EDA Research Funding organized by Prof. Kahng - slides posted here with permission of panelists! Congratulations to Jiajia Li on filing his Ph.D. thesis!!! Congratulations to Jiajia Li on passing his Ph.D defense!!! Congratulations to Kwangsoo Han on passing his University Qualifying Examination!!! Congratulations to Siddhartha Nath on passing his Ph.D. defense. SIA has announced the publication of ITRS2.0 (2015 edition)! ABKGroup members provided System Integration chapter contents. Congratulations to Lutong Wang on passing his ECE Prelim Exam today!!! A. B. Kahng, "Andrew Kahng on Industry-Academia Cooperation" (blog post about April 6 CDNLive talk, San Jose, CA). A. B. Kahng, "PPAC Scaling at 7nm and Below" (blog post about April 7 Cadence Distinguished Speakers Series talk, San Jose, CA). A. B. Kahng, "In Search of Lost Time", Keynote Address, TAU-2016, Santa Rosa, CA. Congratulations to Kwangsoo Han on passing his ECE Prelim Exam today!!! Congratulations to Vaishnav Srinivas on passing his University Qualifying Examination!!! Congratulations to Wei-Ting Jonas Chan on passing his University Qualifying Examination! Congratulations to Jiajia Li on passing his University Qualifying Examination! Congratulations to Pooja Shah on filing her M.S. thesis. Congratulations to Hyein Lee on passing her University Qualifying Examination! A. B. Kahng, Presentation at SRC Summer Study (session on Power-Performance-Density-Cost Extension of CMOS Technology to Meet Evolving Demands), Atlanta, GA.
A. B. Kahng, "Physical Synthesis 2.0", Keynote Address, IWLS-2015, Mountain View, CA. A. B. Kahng, "When Will the Cost of Dependability End Innovation in Computer Design? ", Panel Talk, VTS-2015, Napa, CA. A. B. Kahng, "A Roadmap for Low-Power Design: Trends, Technology, Tools", Keynote Address, EDPS-2015, Monterey, CA. Congratulations to Siddhartha Nath on passing his University Qualifying Examination! A. B. Kahng, "Assessing Costs of Variability, Reliability and Resilience", NSF Variability Expedition / DFG SPP 1500 Colloquium, Munich, Germany. Congratulations to Tuck-Boon Chan for successfully defending and filing his Ph.D. thesis! Congratulations to Tuck-Boon Chan on passing his University Qualifying Examination. Congratulations to Hyein Lee on passing her ECE Prelim Exam today!!!!!!! Find the new ABKGroup research overview here! Congratulations to Wei-Ting Jonas Chan for passing the ECE Ph.D. Prelim Exam. Congratulations to Vaishnav Srinivas for passing the ECE Ph.D. Prelim Exam. Congratulations to Seokhyeong Kang for successfully defending and filing his Ph.D. thesis. Congratulations to Siddhartha Nath for passing the CSE Ph.D. Research Exam. Congratulations to Jyoti Wadhwani for graduating with her ECE M.S. degree. Congratulations to Jiajia Li for passing the ECE Ph.D. Prelim Exam. Congratulations to Tuck-Boon Chan for being chosen as one of four winners of the 2013 Qualcomm Fellow-Mentor-Advisor (FMA) Fellowship, for the project "Timing Corner Optimization for Design Implementation and Signoff in Advanced Process Nodes". 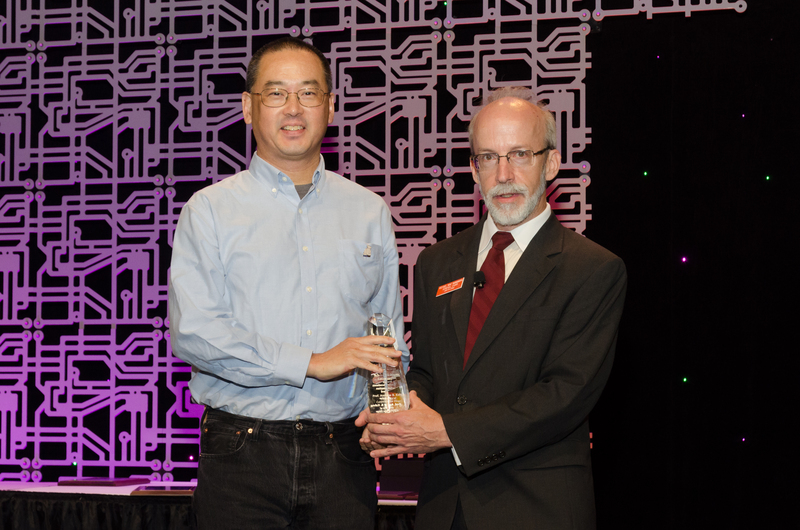 50th DAC Recognition of 20+ years of ABKGroup: Prof. Kahng will receive several recognitions on June 5, 2013 at the 50th Anniversary Banquet of the ACM/IEEE Design Automation Conference. He is one of the 10 most cited authors, and the third most collaborative author, in DAC's 50-year history. He is also in the "DAC 40 club" with 40+ DAC papers, and among the 10 most prolific authors in each of DAC's fourth and fifth decades. Congratulations to Sherief Reda for receiving tenure at Brown University! Congratulations to Seokhyeong Kang and Hyein Lee for winning second place (Metric #1) and first place (Metric #2) at the ISPD-2013 Gate Sizing Contest as part of the Trident (UCSD + U. Michigan) team! Congratulations to Puneet Gupta for receiving tenure at UCLA! Prof. Kahng is one of the 52 members of the 2012 ACM Fellows class (link), for contributions to physical design automation and to design for manufacturability of microelectronic systems. A. B. Kahng, "Design-Based "Equivalent Scaling" to the Rescue of Moore's Law", University of California, Irvine, CA. A. B. Kahng, "DfX and Signoff: Challenges and Opportunities", Keynote Address, IEEE Computer Society Annual Symposium on VLSI, Amherst, MA. Congratulations to Seokhyeong Kang on passing his ECE qualifying examination. Congratulations to Kwangok Jeong for receiving the 2012 EDAA Outstanding Dissertation Award (Topic Area 3). A. B. Kahng, "Multi-Patterning Optimizations for the Long Run", ICCAD-2011 Nanolithography & IC Design/CAD in Extreme Scaling Workshop talk. Gate-length biasing technology from UCSD achieves cumulative energy savings at "trillion watt-hour" scale. UCSD press release [cached]. Congratulations to Kwangok Jeong on filing his Ph.D. thesis. Congratulations to Kwangok Jeong on passing his Ph.D. defense. A. B. Kahng, "Energy Efficiency and Resilience in Future ICs", Yale University. A. B. Kahng, "The Future of Signoff", opening keynote, TAU-2011, Santa Barbara, CA. A. B. Kahng, "Futures at the Design-Manufacturing Interface", KAIST EE Department, Daejeon, Korea. A. B. Kahng, "Research and Graduate School Advice", CSE101, Winter 2011. Congratulations to Kambiz Samadi on defending and filing his Ph.D. thesis. Congratulations to Seokhyeong Kang on passing his ECE Prelim examination. The login password for ABKGroup local pages has recently been changed. If you believe that you should have access, but have not been notified the password change, please contact ABK or Seokhyeong. Rasit Topaloglu successfully defended his thesis and filed. Chul-Hong Park successfully defended his thesis and filed. Puneet Sharma successfully defended his thesis and filed. Chul-Hong Park passed his qualification exam. Kambiz Samadi passed his Prelim. Congratulations to Rasit Topaloglu for Best Paper award in ISQED 2007! Prof. Kahng's "CAD Research, Pay now or Pay later ..." presentation. Congratulations to Xu Xu for successfully defended his thesis and will file this week. Sherief successfully defended his thesis and filed last week. Qinke successfully defended his thesis and will file this week. Puneet Sharma passed his UQE. Congratulations to Xu Xu for 1st place in Best Poster Award and Best Paper Award in BACUS 2005! Congratulations to Bao Liu and Qinke Wang for Best Paper award in ICCD 2005! Congratulations to Xu Xu for passing his qualification exam! Congratulations to Qinke Wang for passing his qualification exam! Congratulations to Yuhong Zheng for filing her M.S. thesis! Congratulations to Puneet Gupta and Swamy V. Muddu for completion of their M.S. degrees at UCSD! for filing his Ph.D. dissertation at UCLA! DNA array design software released! The implemented algorithms are described in papers #141 and #159, available on the conference publications page.The code can be downloaded here. Congratulations to Dr. Yu Chen for filing his dissertation (at UCLA). Congratulations to Dr. Mike Oliver for filing his dissertation (at UCLA). Congratulations to Dr. Bao Liu for filing his dissertation.